Stem: Solid, squared stick with 4 grip rings. May be trimmed. Seams: Rim - Thin seam traveling the total length of the body, up and over the stem and back down the other side. Barely felt. Body - Seam found on the top of the rim and may have some extra pieces or jagged silicone which is soft enough to move under finger tip. Colors: Fleur no longer offers colors under the "Fleur" name. The current cup only comes in a frosted white. Overall Impression: This cup has been around for a while now and has made a name for itself. Although some cups may arrive with some extra bits of silicone along the seam, the cup still seems well made. The stem on the large size cup is firm and not stretchy like that of the smaller size. 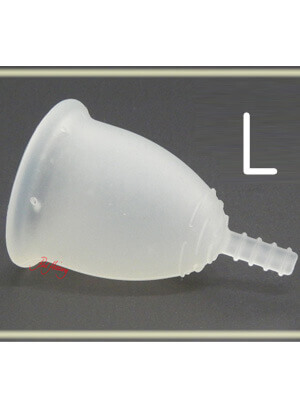 Since this cup is one of the lengthier bell-shaped cups out there, the large would suit someone with a medium to high cervix or someone with a moderate flow. The downfall of this cup is the very pronounced grip rings. While some are not sensitive to feeling these, others find them uncomfortable.